← In Singapore, the ‘heritage’ we promote exists mainly in our museums and galleries?? 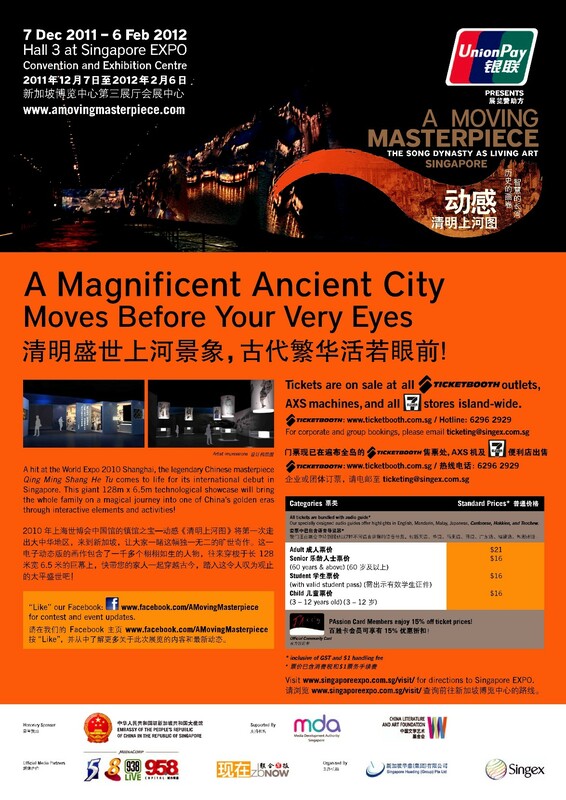 A new ‘mega’ exhibition has opened in Singapore last night: ‘A Moving Masterpiece’ (click ‘here‘) for more info. I went for a free ride. Basically, the 5m+ long painting in question is 900+years old from the Song dynasty, and is regarded to be one of the most important Chinese artworks in the world. So far, I’ve not mentioned anything about the ‘real’ artefacts on display. Read my lips: T-H-E-R-E A-R-E N-O R-E-A-L A-R-T-E-F-A-C-T-S on display. While you are navigating your way through the cavernous hall to get to the screen-projection, you would pass many showcases with stuff inside, but NONE are real. And to insult you even more, they didn’t even bother to get ‘old-looking’ new artefacts to make the illusion more believable. For example, there was a chain of red-firecrackers on display (the kind with gold-dust Chinese characters on the sides) which looked straight out of a Chinese new year bazaar in Chinatown. And to make it look ‘important’, it was displayed behind a perspex sheet; as if anyone is going to steal it…. I suppose the organiser wanted visitors to ‘learn something’ about Song culture before seeing the projection. But they failed, miserably. The displays looked ‘cheap’ – because they are cheap – and didn’t teach me anything about the Song dynasty. It really felt like someone decided to make it a ‘large’ exhibition so they could justify the higher than normal ticket prices (compared to a blockbuster show at Asian Civilisations Museum for S$8-10/ticket, for example). So was I entertained when I went to the opening last night? Yes. I was in Shanghai last year for the World Expo and I didn’t get to go to the China pavilion to see this on display (this was the main draw of that pavilion, and people queued up for 8-9hrs just to get in). So I’m glad I finally got to see what I had missed a year ago. But if I had to pay S$18-20 to see the projection (which is the adult ticket-price in S’pore), I would have asked for a refund; I’m a ‘real-artefact’ kinda of person and any whiz-bang computer-work would never replace the tangibility of one small, real artefact.